1982. First Edition. Spiral bound. Very good. 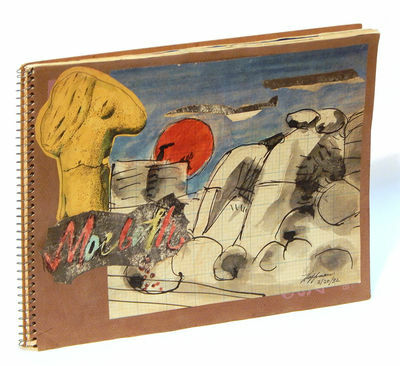 Wide quarto (23 x 30 cm), pp. . Spiralbound sketchbook, brown covers with paste-down collage of color and black and white images on front. Cover is signed and dated "2/20/82." Seventeen original drawings, paintings and collage (pen and ink, watercolors, markers, colored paper, etc.) dated from February 13 to 20,1982, depicting the artist's response to a production of Shakespeare's great tragedy. Each piece depicts a specific scene, often with lines from the play included. Poem titled "Macbeth (After seeing Nicol Williamson's production at the Circle in the Square, matinee, February 13, 1982)" pasted onto inside front cover. Several pages wavy from watercolor application. Light bumping and wear to extremities. Hoffman (1921-2013) was a painter, illustrator, poet, teacher and veteran of WWII and the Korean War. In addition to painting murals for U.S. Army installations and the New Castle PA Public Library, he has had one-man shows at the Crespi Gallery (NYC), the Phoenix Gallery (NYC), the American Embassy Gallery (Oslo, Norway), the Cleveland Museum of Art, the Denver Art Museum and the Arts and Crafts Center (Pittsburgh), as well as numerous groups shows across the country. He also had a career in public relations at McGraw Hill. The production inspiring this book was directed by Scottish theatre artist Nicol Williamson, who also played the title character. Though the production received mixed reviews, Williamson has been described as "the greatest actor since Marlon Brando" by John Osborne (author of Look Back in Anger) and as "touched by genius" by Samuel Beckett. Film buffs perhaps best know him from his roles in Excaliber and The Exorcist III.